This is the nation’s most marvelous and largest collection of Victorian era cottages. We are familiar with the suburban housing that was built in great quantities after World War II—tracts of housing in which each home looks very similar to every other home and where owners strive to distinguish their property. 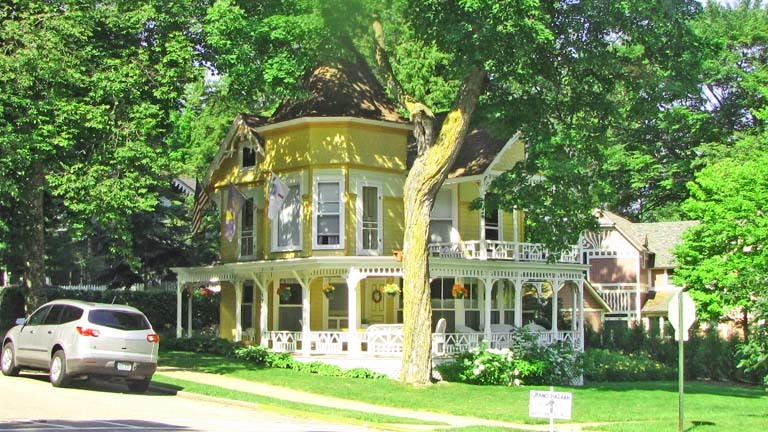 In Bay View, there are more than 400 Victorian homes. Each one looks very different from the other one since each one illustrates its own distinctive style. Most are basically Victor ian. This was a highly planned community with almost all residences built within a twenty-year span. But it is a housing development unlike any other housing development you will visit and thus worthy of its designation as National Historical Landmark. In September, 1875, several Methodist ministers met in Jackson, Michigan and agreed that it would be ideal if a summer community could be established where member of their churches might go each year to enjoy themselves and be enlightened. This was just before the era of the Chateau movement; that is, the popular movement establishing collections of summer cottages where vacationers could come and hear lectures, learn about music or engage in other stimulating cultural activities. The Methodist ministers looked around and decided that the shores of Little Traverse Bay just north of Petoskey would be ideal for their project. They secured 337 acres of shorefront property. They formed the Bay View Association and encouraged people to come and build cottages. In return, there would be summer programs focused upon cultural developments and religion. From time to time, these programs featured famous speakers. There were several recent developments in the 1870s that encouraged this kind of activity. Cities were growing very rapidly as industrial activities boomed. That meant that cities were extremely dirty places because soft coal was widely used by factories and railroads and horses were used for all local transport. Cities were also recognized as dangerous places since diseases frequently caused many to get sick and some to die. In the late Nineteenth Century, many cities had yet to provide clean water and good sewage systems so city mortality rates greatly exceeded those of rural areas. In the decades after the Civil War, rich merchants and entrepreneurs from the East began to build large mansions along the Atlantic Coast in New England while some from Chicago selected the sunnyt shore of Lake Michigan for their summer homes. Most could not afford a separate home for summer use only but might be able to afford a week or two at a location such as Bay View, where they could enjoy the beach but also be enlightened if they wished to attend lectures and concerts. By 1877, the Bay View area had been platted and about 20 cottages had been built. After the arrival of the railroad in Petoskey, it became much easier for people to reach Bay View from all points in the Midwest. By 1887, 125 cottages had been built along with a hotel and a chapel. 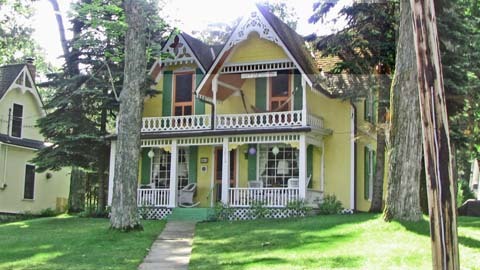 At present there are 437 cottages and 29 other public buildings, including a large Queen Anne style Chautauqua cottage dating from 1887. Evelyn Hall is another large Queen Anne building built in 1890 for assemblies. Newer buildi ngs include the John M Hall Auditorium dating from 1914—not designed in the Victorian style—and, one of the most recent, the Bay View Library designed by architect Earl Mead in 1923. 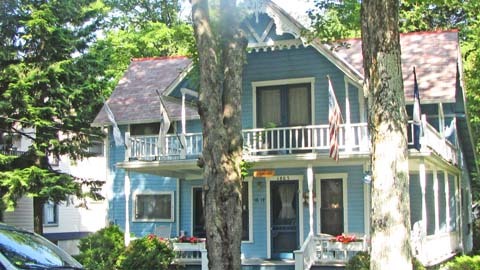 There is a post office in Bay View and two hotels: Stafford’s Bay View Inn built in 1886 and the Terrace Inn Bed and Breakfast constructed in 1911. Most of the cottages and other structures were erected between 1885 and the start of World War I. The cottages are privately owned but, the property on which they sit is owned by the Bay View Association. There are, I infer, strict rules about remodeling homes and fences are prohibited. Since they are all well maintained cottages, it is a most impressive place to visit. Please do not be fooled by the term cottage. These are not three-room, short-term vacation homes. Those who built cottages here often erected something very much larger than the typical suburban home. 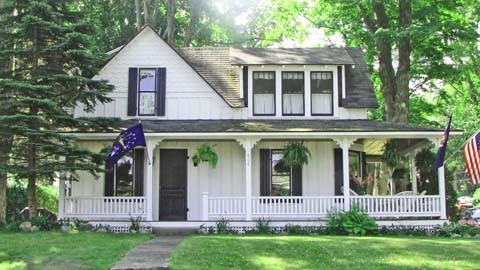 When these cottages were built, woodworking was in fashion so some of them offer exuberant displays of shiplap boarding and very original woodworking with two-story porches, elaborate lattices that would take days to paint and spindle work almost too complicated to comprehend. At that time, a variety of colors were applied to the cottages themselves and to the extensive woodwork attached to them. Petoskey paint stores must have carried a vast array of hues at the turn of the Twentieth century. Community regulations also, I believe, allow owners to occupy their homes in Bay View only from April through October so this is certainly not a retirement community. For enumeration purposes, the Census Bureau designated Bay View as a Census Designated Place. In April, 2010 there were only 55 occupied buildings in Bay View with a total of 133 residents. Presumably some of these were staff members or the maintenance staff. While this community was founded by Methodists, it welcomed people of all faiths from the outset. It was and remains affiliated with the United Methodist Church. The programs that it organized were not parochially Methodist. Indeed, one of the primary foci at present for Bay View is music. 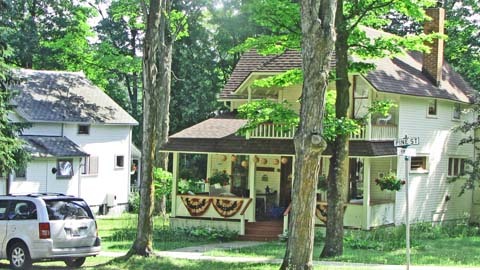 Use in 2012: Summer community in the Chautauqua tradition.